On December 5th, the warehouse of Alpinist Magazine – which is arguably the single best climbing publication out there today – burned to the ground. 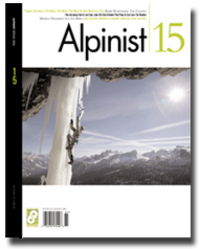 Known for its unique articles, dedication to alpinism rather than whatever seems to sell best at the moment, and the amazing photography which accompanies each story, Alpinist Magazine has been called more of a collector’s book than a magazine. In the brief years since it’s inception, Alpinist has become one of the tops of the genre…and needless to say, this warehouse fire will set them back severely. All of their inventory – back issues, current issues, products, etc. – were completely lost, and it all happened just before the holiday season. So, Alpinist is making a very reasonable request which I’d like to echo: If you were considering giving Alpinist as a gift, subscribing to the magazine for the first time, or renewing your subscription, please do so now and help keep this wonderful publication alive and well! I will get the word out up here too.